Today, we're making a traditional chocolate dessert that comes with a unique name. 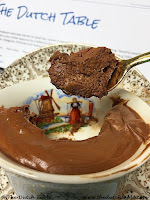 Hemelse modder, heavenly mud, is a name that evokes images of cute little piggies rolling around in unctuous, chocolatey pools of sweet sludge, chocolate clay, divine dirt....you get my drift. Or maybe that's just me :-) but let's face it: don't those two words sound at least intriguing and worth exploring, spoon in hand? Chocolate, in its many forms, is no stranger to the Dutch. It is rumoured that the Spanish Duke of Alva introduced chocolate to the Netherlands, during his stay from 1566 to 1573. At the time, it was only consumed as a beverage which the Dutch called "seculatie", and served in coffee houses. But chocolate never really left once it arrived, and although surrounding countries like England, France and Germany pioneered the implementation of the cacao bean into other products, Dutch merchants controlled virtually the entire trade in cocoa beans. 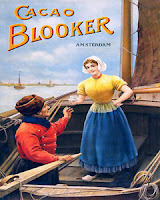 Amsterdam developed into the most important cocoa port in the world and several well known chocolate companies, such as Blooker and Van Houten got their start during these times. This last one, Van Houten, made an extremely significant mark in the global chocolate history. In 1815, Dutch chemist Coenraad van Houten introduced alkaline salts to chocolate, which reduced its bitterness. Not satisfied with that development, a few years in 1828, he created a press to remove the natural fat (cacao butter) from chocolate, which made chocolate both cheaper to produce and more consistent in quality. This innovation introduced the modern era of chocolate. Known as "Dutch cocoa", this machine-pressed chocolate was instrumental in the transformation of chocolate to its solid form. 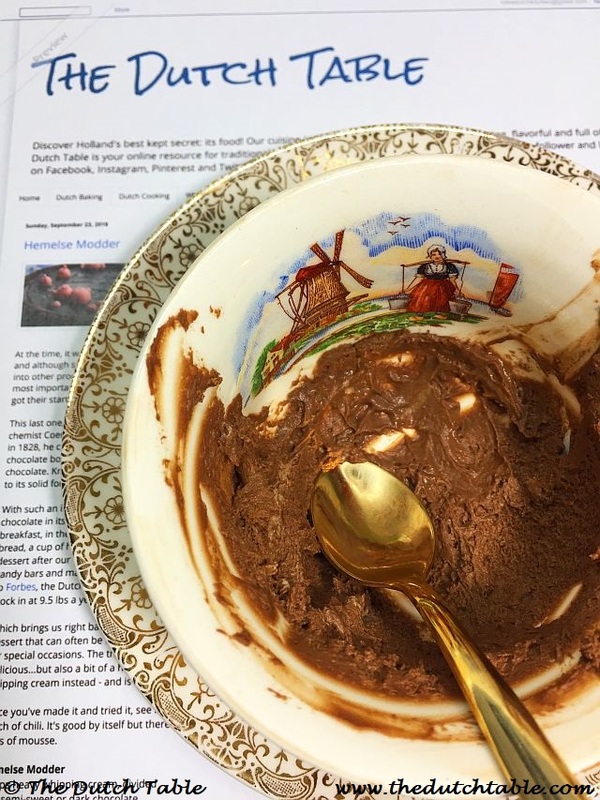 With such an important role in our own economy, and that of the world, it is no surprise that chocolate in its many forms plays an important factor in our food history. 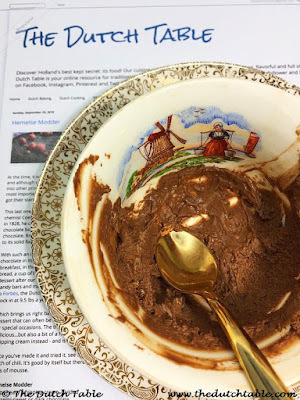 We have chocolate for breakfast, in the form of hagelslag, chocolate sprinkles, or chocolate paste on our morning bread, a cup of hot chocolate to warm us up during cold skating days, and chocolate vla for dessert after our warm evening meal. And that is without mentioning bonbons, chocolate bars, candy bars and many other candies and confectionery that includes chocolate. Who doesn't look forward to the chocolate letter in their shoe for Sinterklaas? According to Forbes, the Dutch consume at least 10 lbs of chocolate per year, right above Americans who clock in at 9.5 lbs a year. 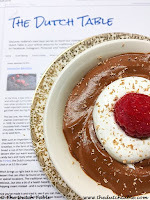 Which brings us right back to our recipe: hemelse modder, chocolate mousse. It's a rich, creamy dessert that can often be found on the dessert menu of Dutch restaurants, or made at home for special occasions. The traditional recipe calls for egg whites and egg yolks to be mixed in with melted chocolate. Delicious...but also a bit of a health hazard, as the eggs are not fully cooked. This recipe omits the eggs and uses whipping cream instead - and is surprisingly light, moussy and chocolatey. And best of all, it will be safe to eat! Once you've made it and tried it, see if you can make it your own: add a splash of vanilla, maybe some cinnamon, or a pinch of chili. It's good by itself but there is no reason why you can't personalize it. Have fun! 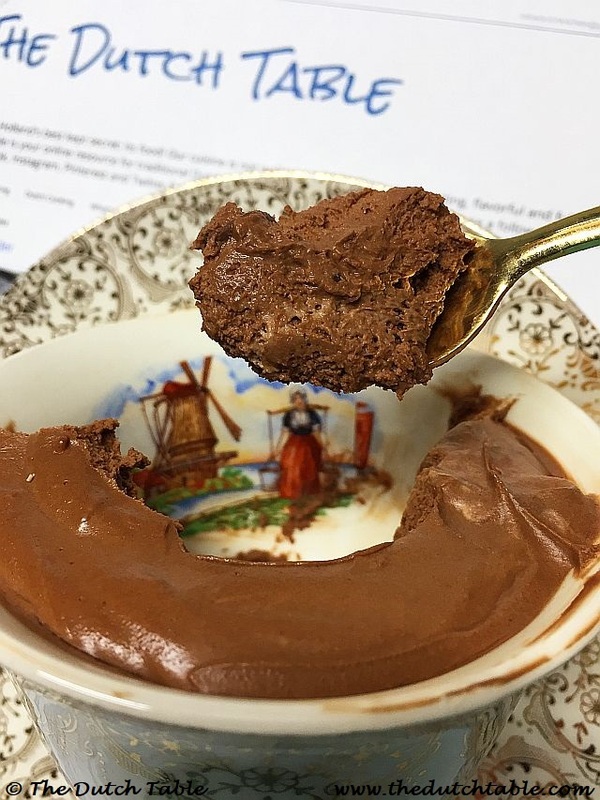 Makes approximate four cups of mousse. Slowly warm half of the heavy whipping cream with the chocolate on the stove, stirring, until the chocolate is just melted. There is no need to bring it up to high heat, just warm will be enough to melt the chocolate. Set aside to cool. When it's cold, whip the rest of the cream with the sugar until stiff peaks form. Carefully fold the cold chocolate mixture into whipping cream, trying to not loose any air. Slowly pour the mixture into serving dishes (you can also use mugs, bowls or glasses), cover each one with plastic wrap or cling film and return to the fridge to set up. It should take about an hour and a half, to two hours, to set up. Decorate with a dollop of whipped cream, fresh fruit or chocolate sprinkles, whip out your favorite spoon and enjoy!!! !